Deadline to enter to win is Wednesday, November 3rd, 2010, 7pm (EST). In the tradition of Peter and the Wolf, North Pacific Music has recently produced a fabulous story CD, Ferdinand the Bull and Friends, narrated by David Ogden Stiers — and we have a copy to giveaway to one lucky family! Deadline to enter to win is Wednesday, November 3rd, 2010. Details below. Narrator David Ogden Stiers is joined by award-winning cellist Nina Flyer and pianist Chie Nagatani in performing music created and arranged by up-coming composer, Mark Fish — a name in to watch out for in the children’s music world. Together they create an intelligently educational and entertaining sound world of three stories — never pandering, never pedantic, always engaging — alluring to both children and adults. TRADING CARDS: Include are 15 shiny firm CD-sized trading cards. The 15 poems of Ogden Nash are illustrated by Devin Bernard with drawings on the face, and poems on the back. These can be used as novelty conversation pieces or parlor game for children of all ages. Take turns, pick a card, start reading the poem, the first to jump in and finish the poem gets the card - person with the most cards wins. Ferdinand the Bull is a musical setting of The Story of Ferdinand, written in 1932 by Munro Leaf and illustrated by Robert Lawson. The book has become a classic. In this version, certain characters or events in the story have musical themes: Ferdinand’s flower-sniffing waltz (played by the cello), fast piano scales depict other young bulls running around and the fanfare is for the parade into the bullring. And there is a part everyone can play, right along with the recording: put a finger in your mouth, tighten your lips, and “pluck” one side just like the reader — it’s the sound of a cork popping off a bottle, for the cork tree. The Carnival of the Animals was written in 1886 by the French composer Camille Saint-Saëns. The poems from the 1950s are by American poet Ogden Nash. In The Carnival of the Animals Saint-Saëns’ music imitates many animal sounds. For one animal, not known for any sound, he plays a trick. He makes a really slow dance — the famous French Can-Can for the tortoise. The elephant gets a funny waltz and the fossils… just imagine. The Mother Goose Suite: Maurice Ravel loved music and children. With Jean and Mimie, children of his musician friends Cipa and Ida Godebski, he spent hours telling stories and playing games. When they were 8 and 10 years old and learning piano, he composed The Mother Goose Suite for them to play together. Eventually it was so popular he made it into a ballet for a whole orchestra. IT’S THAT SIMPLE! — Deadline is Wednesday, November 3rd, 2010 @ 7pm (EST). 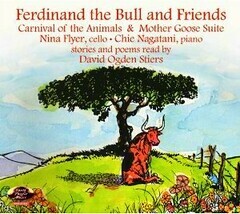 Rachel has won a copy of the newly released CD, Ferdinand the Bull and Friends, narrated by David Ogden Stiers, and should forward her mailing address to hilltownfamilies@gmail.com. One of our favorites has always been Frederick, (the poet mouse) but Ferdinand is up there, too! We love Ferdinand! Strega Nona is a favorite as well.